Michael Allen Smoot, 67 of Knightstown, passed away peacefully on the afternoon of Tuesday, April 10, 2018 at Heritage House in New Castle. He was born on October 19, 1950 in New Castle, a son of Morris and Dorothy (Brammer) Smoot. Mike graduated from Knightstown High School in 1968 and was always very active in the community. He was joyful man and loved Knightstown, especially the Hoosier Gym. He served on the Hoosier Gym board for many years, was a member of the Sons of The American Legion and rode his Harley Davidson with the American Legion Riders Association. Mike retired from General Motors after 36 years of service. During those years he would DJ for weddings, parties and other social events. 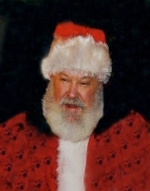 Mike had a wonderful personality and a jolly laugh which aided him in his role as Santa Claus for many years in Downtown Knightstown, MainSource Bank and various places in Indianapolis. Those left to cherish his memory include his father, Morris Smoot; brothers, Pat (wife: Brenda) Smoot and Mark (wife: Diane) Smoot; nieces and nephews, Wesley Smoot, Sarah (husband: Scott) Widner, Tyler Smoot, Audrey Smoot and Olivia (husband: Derrick) Winters; several great-nieces, nephews, numerous friends and his dogs, Harley and Rosie. He was preceded in death by his mother, Dorothy Smoot; paternal grandparents, William and Faye Smoot and maternal grandparents, Earl and Lillie Brammer. Funeral services will be held at 1:00 pm Friday, April 13, 2018 at Heritage Funeral Care in Knightstown with Ray Easley officiating. Burial will follow in Glen Cove Cemetery. Friends may call from 10:00 am – 1:00 pm prior to the service on Friday at the funeral home. You may offer the family an online condolence at www.heritagefuneralcares.com. The Hunt family and Heritage staff are honored to serve the family of Michael Smoot. To send flowers to the family of Michael Allen Smoot, please visit our Heartfelt Sympathies Store.